Zach Borenstein’s home run broke open a 3-3 tie in the eighth inning and helped spur the 51s to an 8-3 victory over Salt Lake on Monday night at Cashman Field. Zach Borenstein’s 18th home run of the season was a no-doubter. The sharp sound of the bat hitting the ball was enough of an indication that the ball was leaving the park without even looking up. That home run broke open a 3-3 tie in the eighth inning and helped spur the 51s to an 8-3 victory over Salt Lake on Monday night at Cashman Field, their seventh straight win. 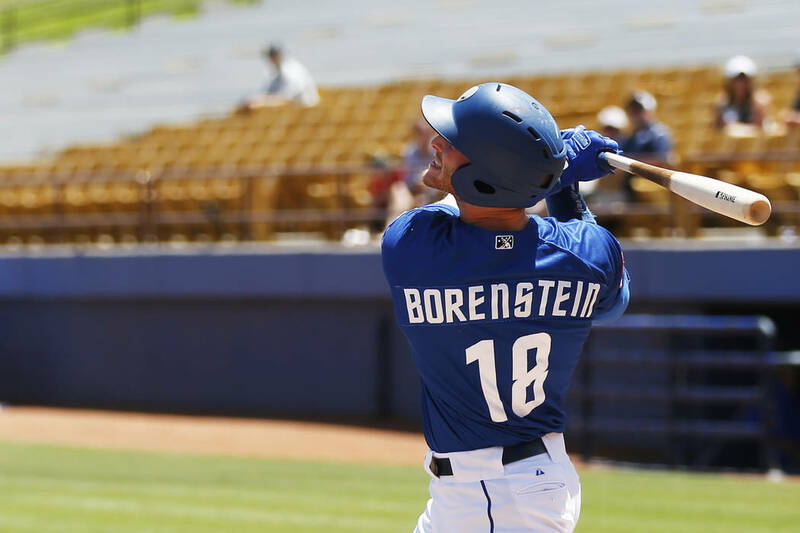 After Borenstein’s home run, the 51s (40-44) added four more runs in the inning to pad their lead. Two came on a Ty Kelly two-run blast while a Luis Guillorme RBI double and Cody Asche RBI single accounted for the other two. All that offense helped the 51s break open a game that Salt Lake had tied just an inning before. Salt Lake (44-40) scored three runs off reliever Buddy Baumann in the seventh inning, two coming on a home run from Eric Young Jr.
Before Baumann gave up the lead, starter Chris Flexen shut down the Bees for six innings. His command was much sharper than his last start in which he walked five batters in three innings. Flexen gave up just four hits and pitched with a lead for most of the night as the 51s had scored three runs in the first inning. Las Vegas struck first on a Borenstein RBI single, Patrick Kivlehan RBI double and Guillorme run-scoring groundout. After that, though, they were mostly quieted by Salt Lake starter Luis Pena in his 5 2/3-inning outing and didn’t break through again until the eighth inning. With the win, they have now won 12 of their past 14 games.